18 December 2015 will be a day long remembered by Star Wars fans. On that day, theaters across North America premiere Star Wars - Episode VII: The Force Awakens. But one Georgia theater has the epic film before all others, and they are screening it for charity. 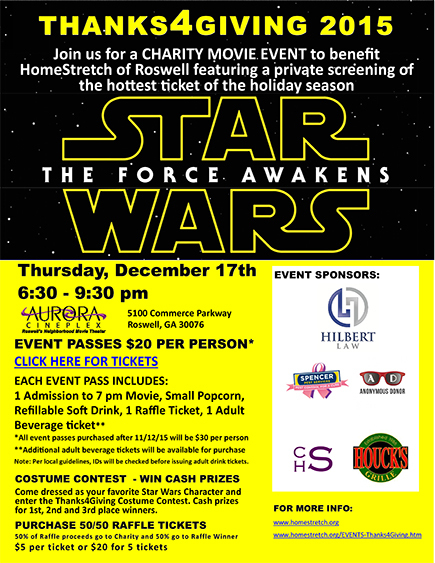 Aurora Cineplex, located at 5100 Commerce Parkway in Roswell, is hosting a private screening of The Force Awakens one full day before the movie arrives in cinemas. The showing is part of a charity fundraiser for HomeStretch. HomeStretch is a nonprofit 501(c)(3) agency that offers long-term assistance for the homeless in the North Fulton community. The organization provides transitional housing and educational skills for low-income families who have nowhere else to turn. Tickets to the Star Wars screening are a very affordable $20, and includes popcorn, drinks, and a raffle ticket. In addition, HomeStretch will host a Star Wars costume contest with cash prizes for the winners. Star Wars - Episode VII: The Force Awakens premieres in theaters across North America, 18 December 2015.